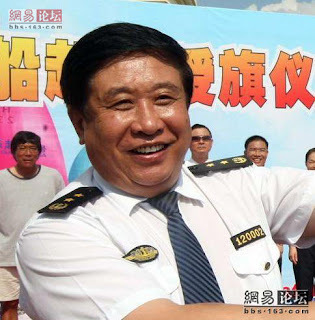 Former Communist Party chief and deputy director of the Shenzhen Maritime Safety Administration Lin Jiaxiang was sacked this week after being identified in an online video, allegedly showing a man attempting to molest a young girl at a restaurant. Mr Lin's sacking comes after an effort by China's "human flesh search engine" – the name given to the country's mass of bloggers and web users – to find a man shown in security camera footage that was spread across the web. 1. The young girl is seen leading the man with the big belly wearing a white shirt to the restroom. 2. Awhile later, the girl is seen running the other direction back into the restaurant. 3. She returns with her parents and brother to find the man and talk to the restaurant manager. 4. The mother and children first return to their dining room. 5. An argument occurs between the man and the girl’s father while the wait staff look on. At first, the parents found the woman who was dining with the man to ask him where he is. The woman (also wearing white) claimed not to know anything and tried to leave. Then the over 50-year-old man with the big belly wearing a white shirt came out of the toilet. To everyone’s surprise, he said, "I did it, so what? How much money do you want, give me a price. I will pay it!" Arrogantly pushing and pointing at the girl’s father, he also said, "Do you know who I am? I was sent here by the Beijing Ministry of Transportation, my level is the same as your mayor. So what if I pinched a little child’s neck? Who the f*** are you people to me?! You dare f*** with me? Just watch how I am going to deal with you." China's leadership has become increasingly quick to react to public incidents of official misbehaviour to try and dampen widespread disgust over corruption and abuse of power by officials. Chinese news blog ChinaSMACK said there was widespread interest in the Lin case and web users were demanding that police investigate. "There are already tens of thousands of replies/comments and hundreds of pages on many different BBS discussion forums by Chinese internet users, demanding that the police properly handle this investigation," read one post. Other online news services carried interviews with the parents of the 11-year old girl in which it was alleged Mr Lin bragged he was a high official from Beijing and offered money to appease them. 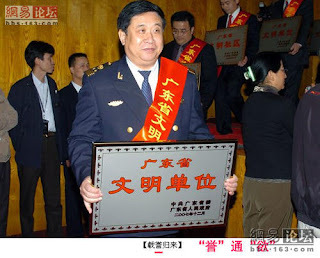 Police were investigating the case and Mr Lin could face further penalties, China Daily reported.